Penetrating wounds to the sole and frog are relatively common but can potentially be very serious injuries. Diagnosis may involve a combination of x-rays and synoviocentesis (sampling joint fluid) to determine the structures involved. 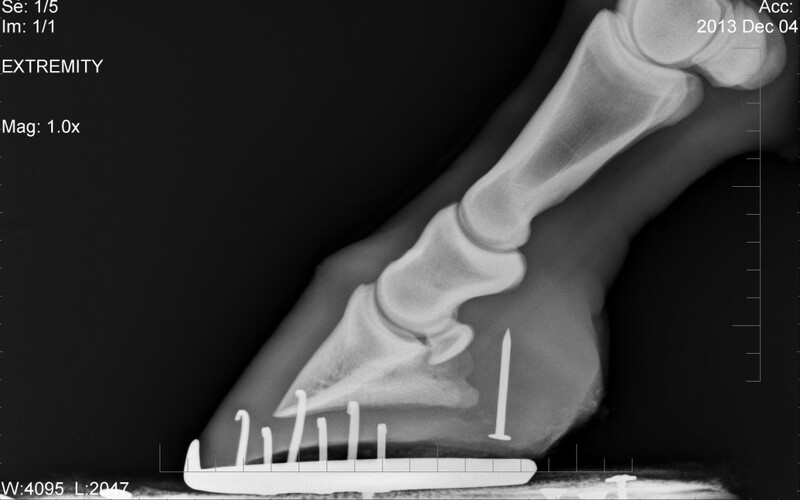 Superficial injuries carry a better prognosis than those wounds which involve deep structures such as the pedal bone, deep digital flexor tendon, navicular bursa and navicular bone etc. The location of the puncture, the nature of the penetrating object and the direction of penetration all influence which structures are affected. 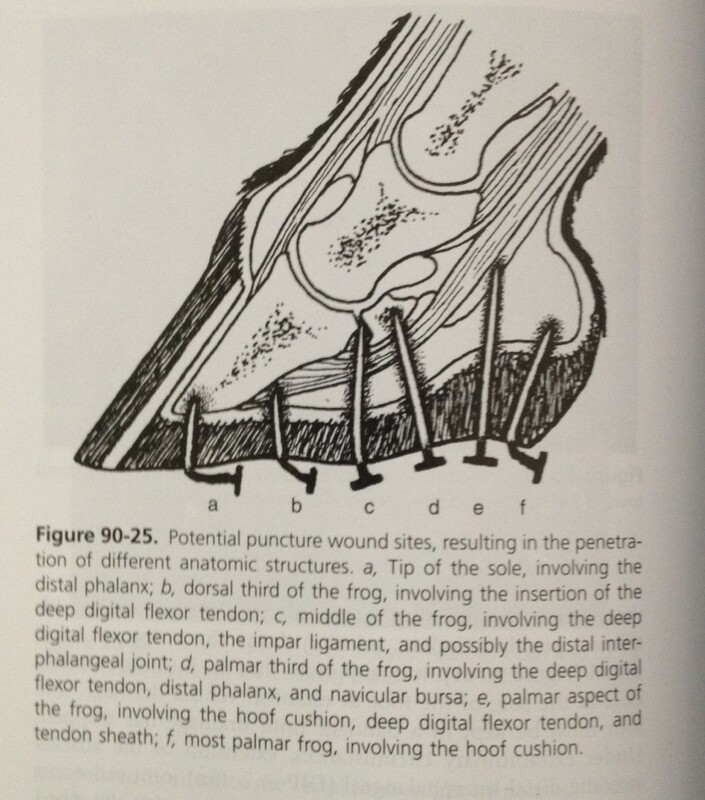 Source: Equine Surgery, Auer & Stick, 4th edition. Where the site of penetration and injuring object are known, diagnosis is more straightforward. Once the penetrating object is removed, the soft horn of the frog tends to collapse, making any tract less obvious. Application of hoof testers along with careful paring by the hoof knife becomes necessary to identify the site of penetration. Clinical signs can be non-specific. Lameness is variable depending on the structures involved and the duration of the injury. Early on, it may be possible to feel an increased digital pulse and an increase in hoof wall temperature. Later, with onset of infection, one may see soft tissue swelling around the coronary band. X-rays of the foot should always be taken to identify any fractures, foreign material or bone infection. Non-metallic objects are not identifiable on x-rays and may require alternative imaging techniques to visualise. Where the penetrating object has been removed, a technique called positive contrast radiography may be needed. This involves the insertion of a sterile metallic probe in to the tract left by the penetrating object. Equally, to test communication of the wound with synovial structures, one can inject into the wound a solution which appears opaque (white) on x-ray. Synoviocentesis (sampling of joint fluid) is another useful way of determining the structures affected by penetration with a foreign object. The gold standard for diagnosis of infection is a positive bacterial culture. However, as this takes 24-48hrs to achieve, it is impractical in the clinic setting where treatment is required immediately. In addition, it can be very difficult to culture bacteria. Other changes in fluid suggestive of infection include an increase in turbidity and pieces of fibrin seen floating within the fluid. Changes in the white cell and protein content of the fluid are further important markers of infection. Surgical exploration may be indicated where the degree of lameness appears greater than anticipated given the injuries identified, and in non-healing or chronically discharging wounds. It may identify injuries that are ‘silent’ on x-ray, such as infected and/or devitalised soft tissue and bone, or foreign material. Antibiotics are a mainstay of treatment in any deep penetrating injury to the foot. The choice of antibiotic is dictated by the likely causative organisms and their sensitivity to antibiotics. Sole wounds will require removal of contaminated and devitalised tissue, which usually involves limited paring. The area should be well cleaned and bandaged. The need for pads and or hospital plate shoes is a matter for individual assessment in every case. Once the initial wound has completely healed, hardening agents may be applied cautiously to the newly formed sole tissue.